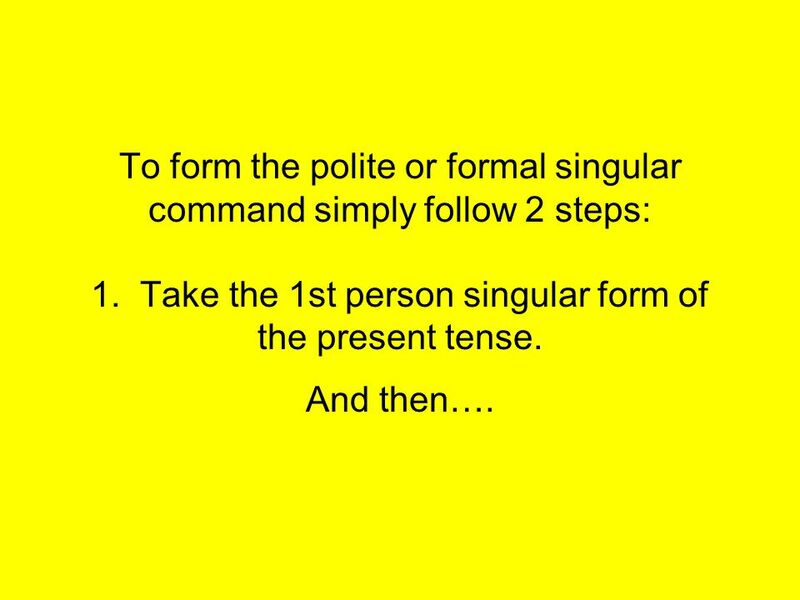 To form the polite or formal singular command simply follow 2 steps: 1. Take the 1st person singular form of the present tense. And then…. 3 2. 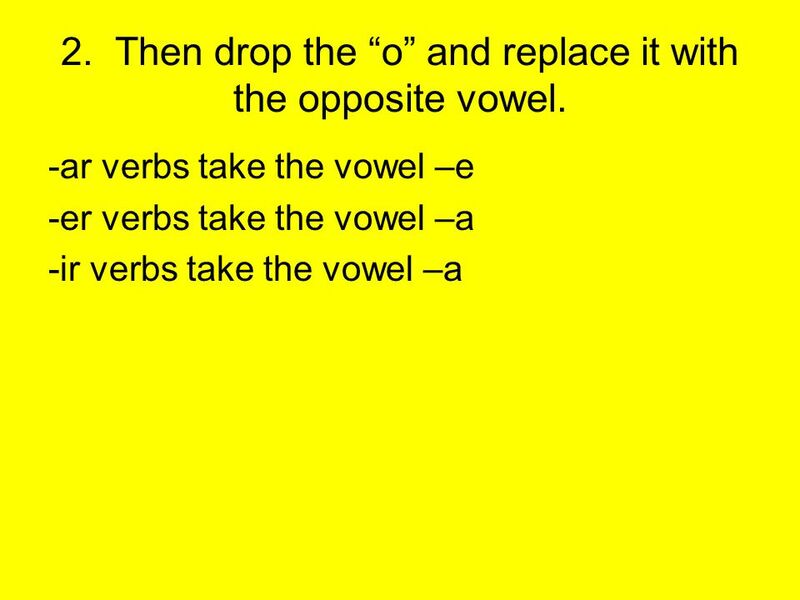 Then drop the “o” and replace it with the opposite vowel. 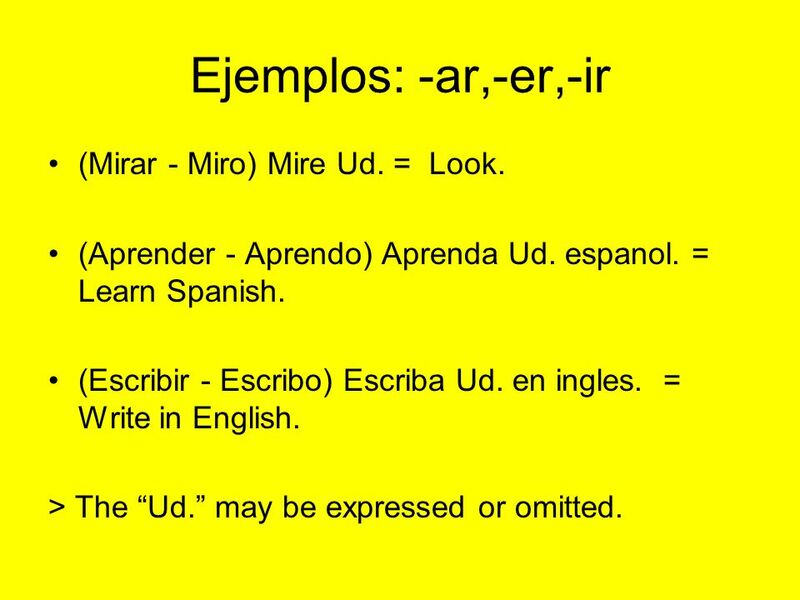 4 Ejemplos: -ar,-er,-ir (Mirar - Miro) Mire Ud. = Look. 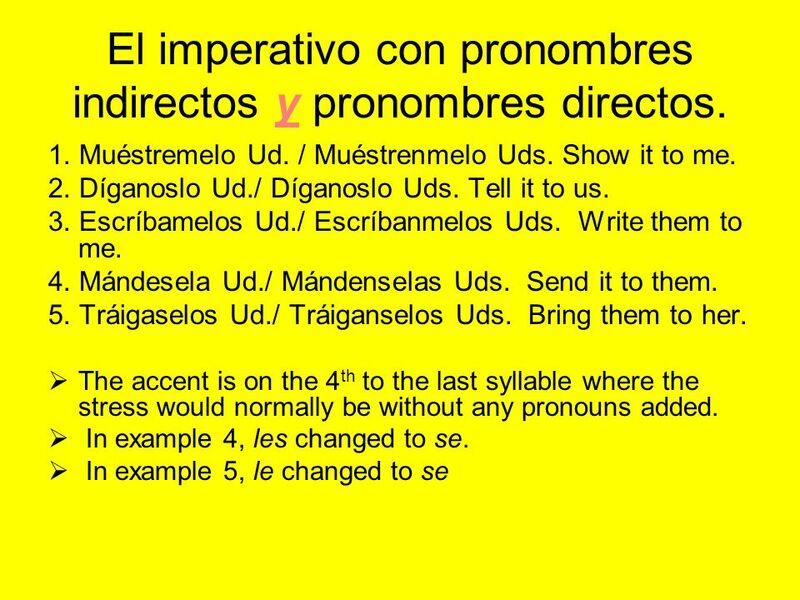 (Aprender - Aprendo) Aprenda Ud. espanol. 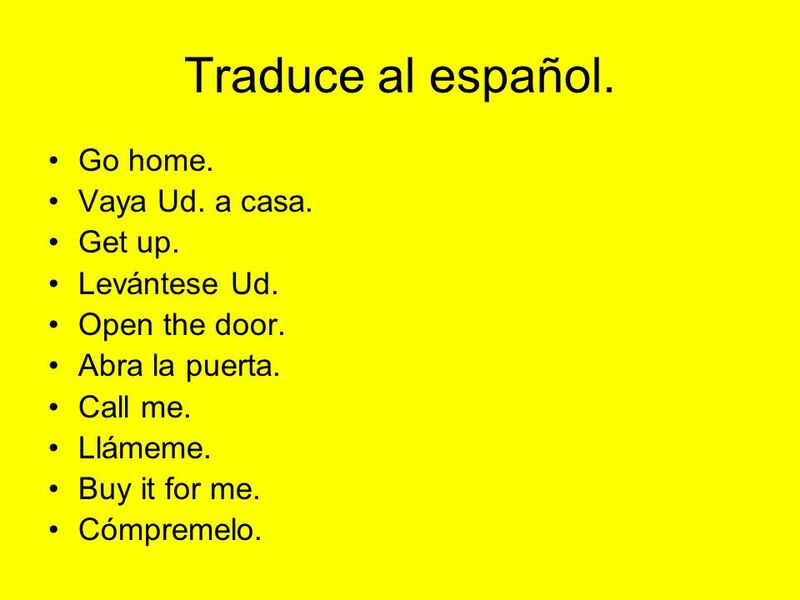 = Learn Spanish. (Escribir - Escribo) Escriba Ud. en ingles. = Write in English. 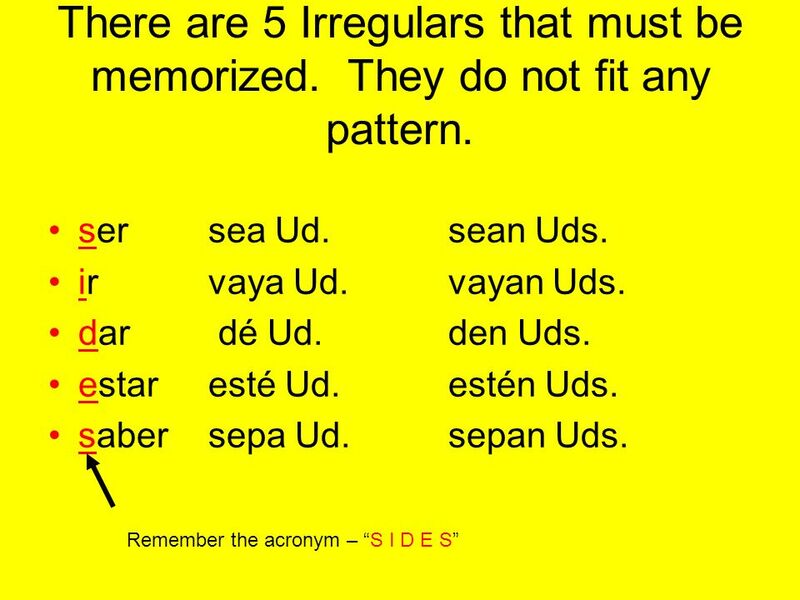 > The “Ud.” may be expressed or omitted. 5 Stem-Changers, therefore, will still occur. Cierre Ud. la puerta. Close the door. Vuelva Ud. a las once. Return at 11:00. Sirva Ud. el pato. Serve the duck. 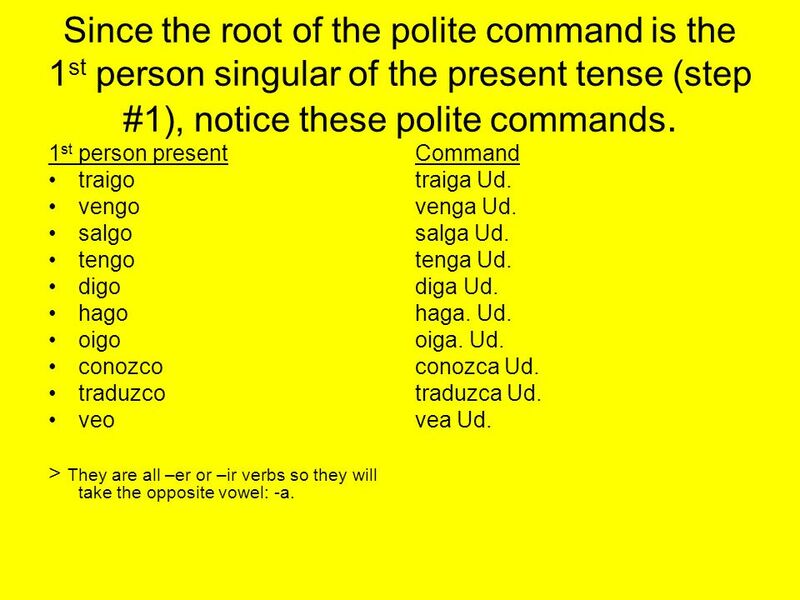 7 Since the root of the polite command is the 1st person singular of the present tense (step #1), notice these polite commands. 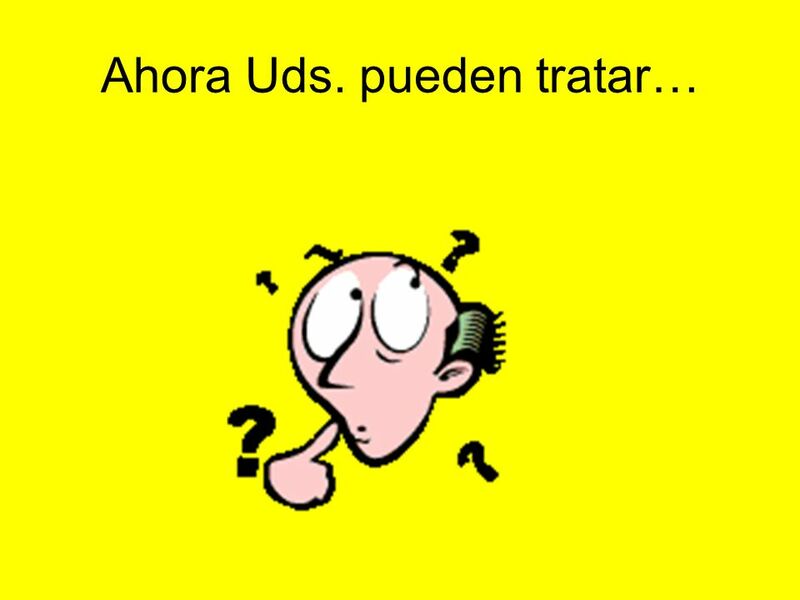 1st person present traigo vengo salgo tengo digo hago oigo conozco traduzco veo > They are all –er or –ir verbs so they will take the opposite vowel: -a. Command traiga Ud. venga Ud. salga Ud. tenga Ud. diga Ud. haga. Ud. oiga. Ud. conozca Ud. traduzca Ud. vea Ud. Just add “No” to make the command negative. 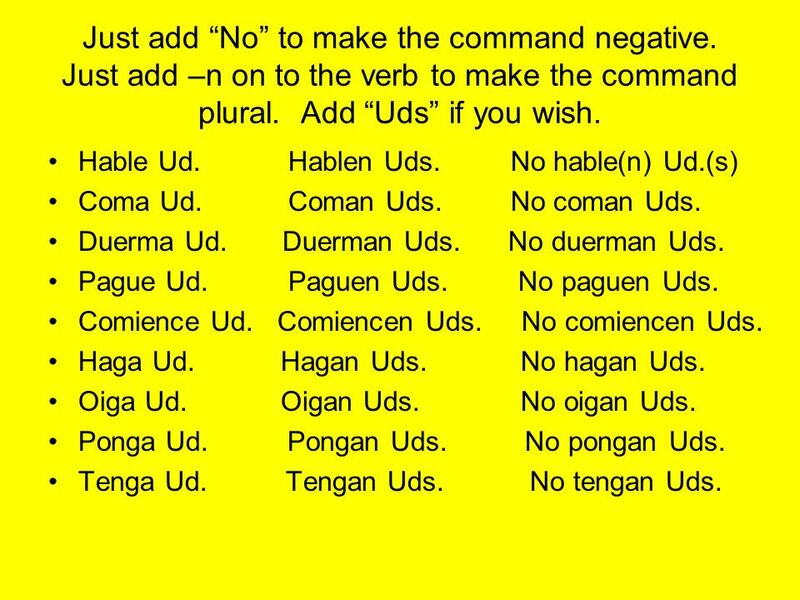 Just add –n on to the verb to make the command plural. Add “Uds” if you wish. Hable Ud. Hablen Uds No hable(n) Ud. (s) Coma Ud. Coman Uds No coman Uds. Duerma Ud Duerman Uds No duerman Uds. Pague Ud. Paguen Uds No paguen Uds. Comience Ud. Comiencen Uds. No comiencen Uds. Haga Ud Hagan Uds No hagan Uds. Oiga Ud Oigan Uds No oigan Uds. Ponga Ud Pongan Uds No pongan Uds. Tenga Ud Tengan Uds No tengan Uds. 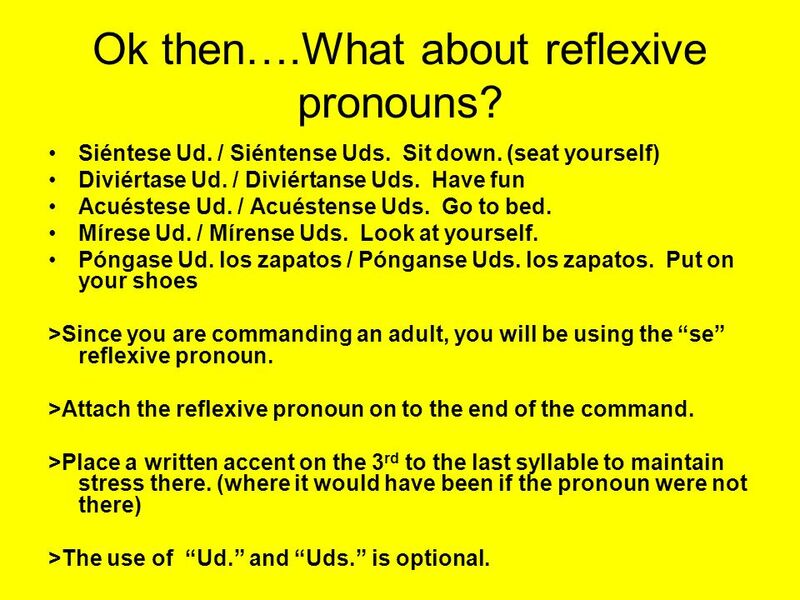 9 Ok then….What about reflexive pronouns? Siéntese Ud. / Siéntense Uds. Sit down. (seat yourself) Diviértase Ud. / Diviértanse Uds. Have fun Acuéstese Ud. / Acuéstense Uds. Go to bed. Mírese Ud. / Mírense Uds. Look at yourself. Póngase Ud. los zapatos / Pónganse Uds. los zapatos. Put on your shoes >Since you are commanding an adult, you will be using the “se” reflexive pronoun. >Attach the reflexive pronoun on to the end of the command. >Place a written accent on the 3rd to the last syllable to maintain stress there. 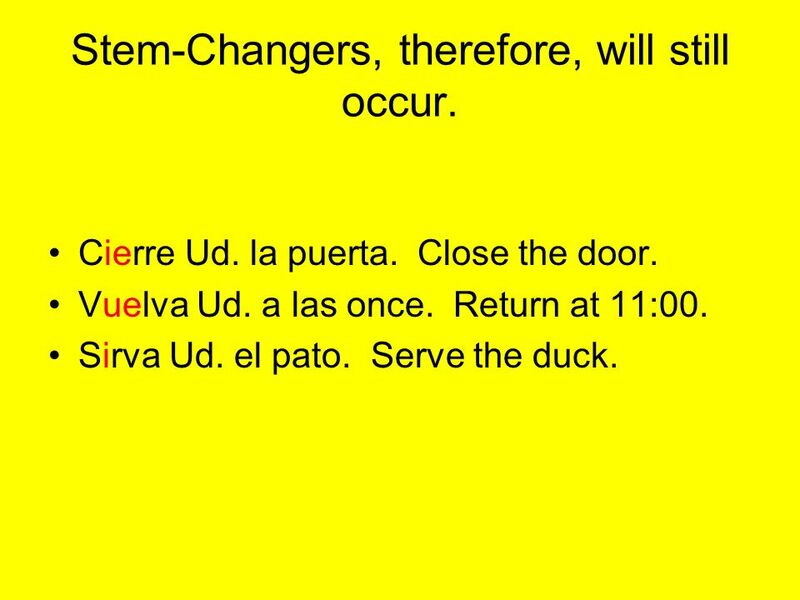 (where it would have been if the pronoun were not there) >The use of “Ud.” and “Uds.” is optional. 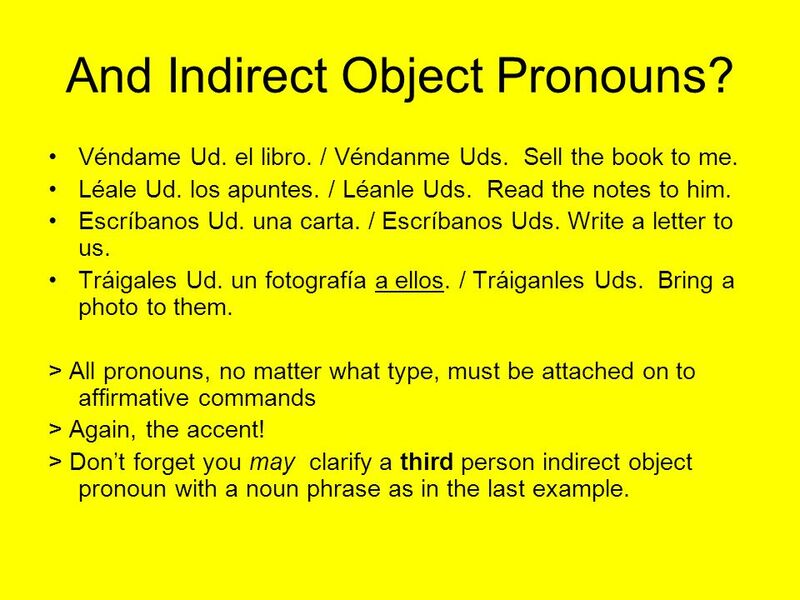 10 And Indirect Object Pronouns? Véndame Ud. el libro. / Véndanme Uds. Sell the book to me. Léale Ud. los apuntes. / Léanle Uds. Read the notes to him. Escríbanos Ud. una carta. / Escríbanos Uds. Write a letter to us. Tráigales Ud. un fotografía a ellos. / Tráiganles Uds. Bring a photo to them. > All pronouns, no matter what type, must be attached on to affirmative commands > Again, the accent! > Don’t forget you may clarify a third person indirect object pronoun with a noun phrase as in the last example. 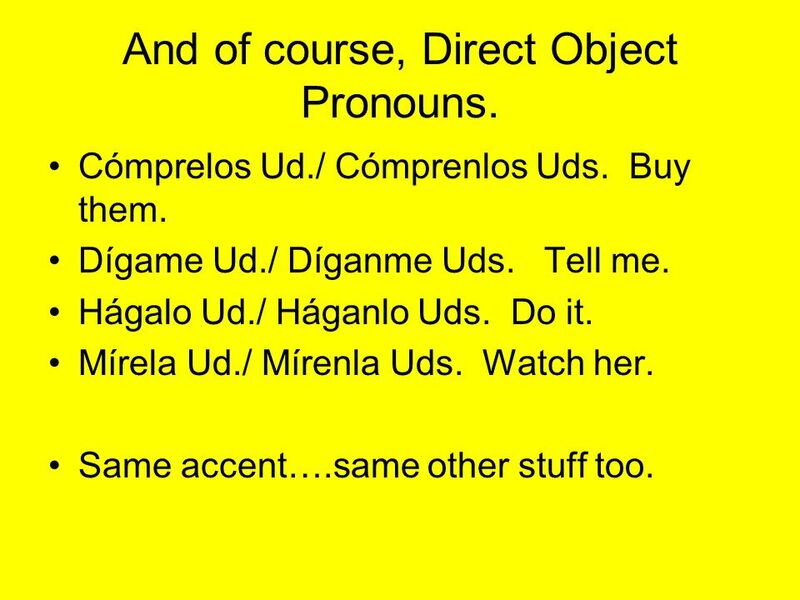 11 And of course, Direct Object Pronouns. Cómprelos Ud./ Cómprenlos Uds. Buy them. Dígame Ud./ Díganme Uds. Tell me. Hágalo Ud./ Háganlo Uds. Do it. Mírela Ud./ Mírenla Uds. Watch her. Same accent….same other stuff too. 12 Last… but not least!!!!! 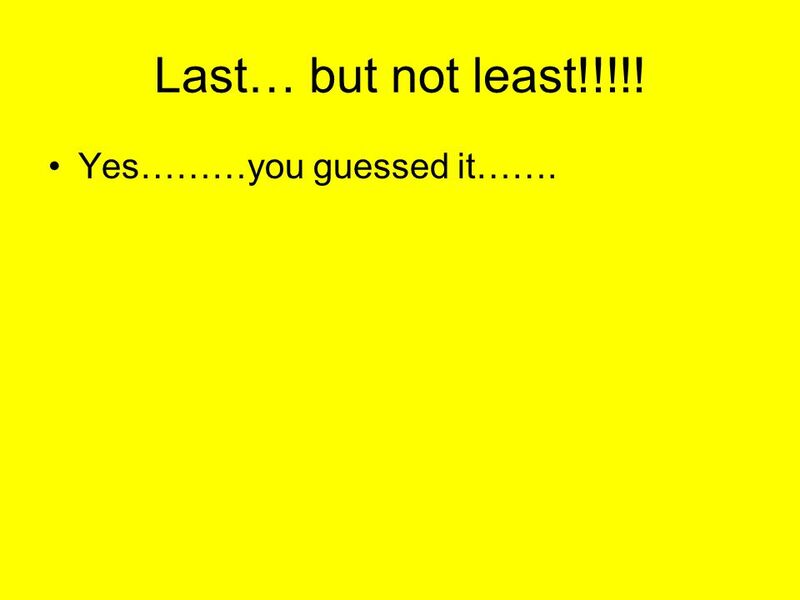 Yes………you guessed it……. 13 El imperativo con pronombres indirectos y pronombres directos. 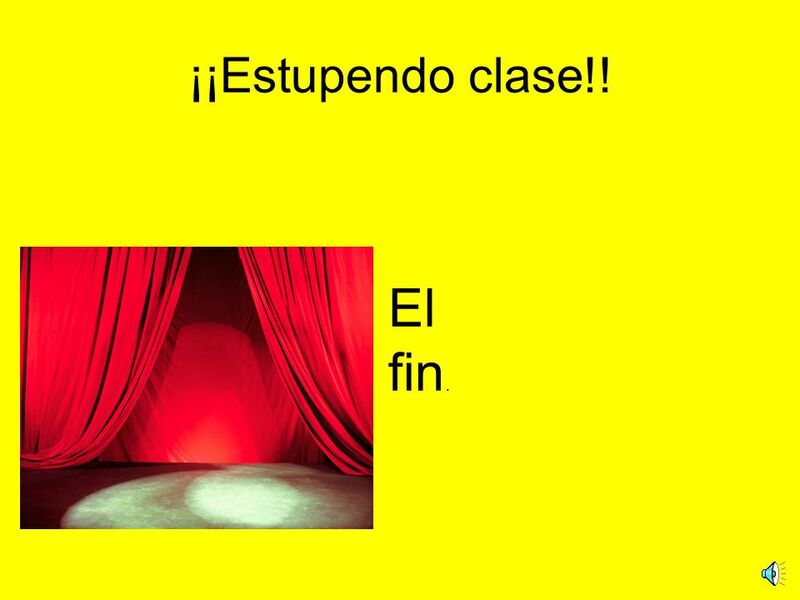 14 Lo siento clase….pero Uds. saben que siempre hay irregulares! As always….. 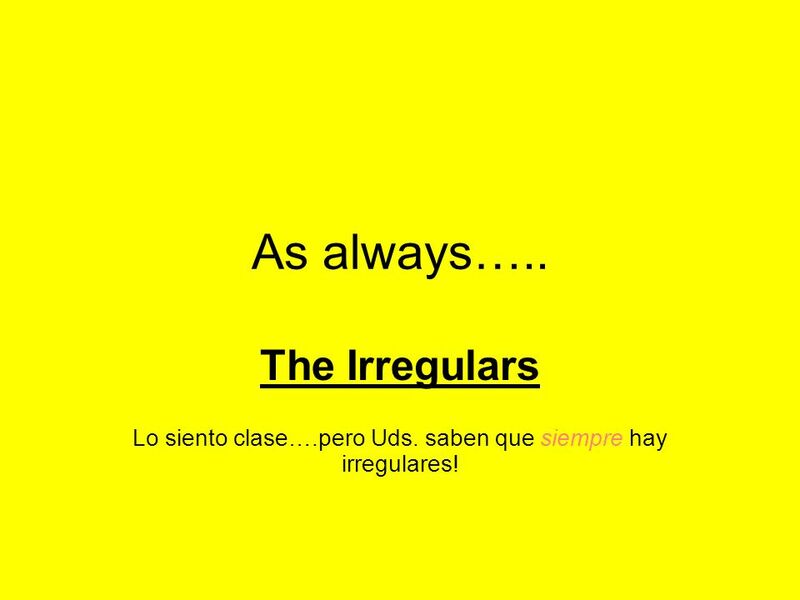 The Irregulars Lo siento clase….pero Uds. saben que siempre hay irregulares! 17 Traduce al español. Go home. Vaya Ud. a casa. Get up. Levántese Ud. Open the door. Abra la puerta. Call me. Llámeme. Buy it for me. Cómpremelo. 18 ¡¡Estupendo clase!! El fin. 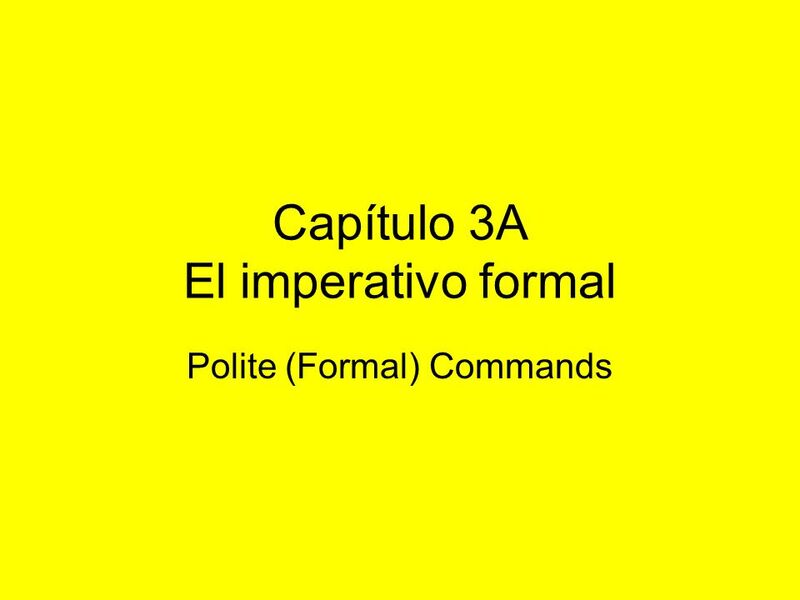 Descargar ppt "Capítulo 3A El imperativo formal"
Formal Commands. Levanten las manos. Escriba su nombre. 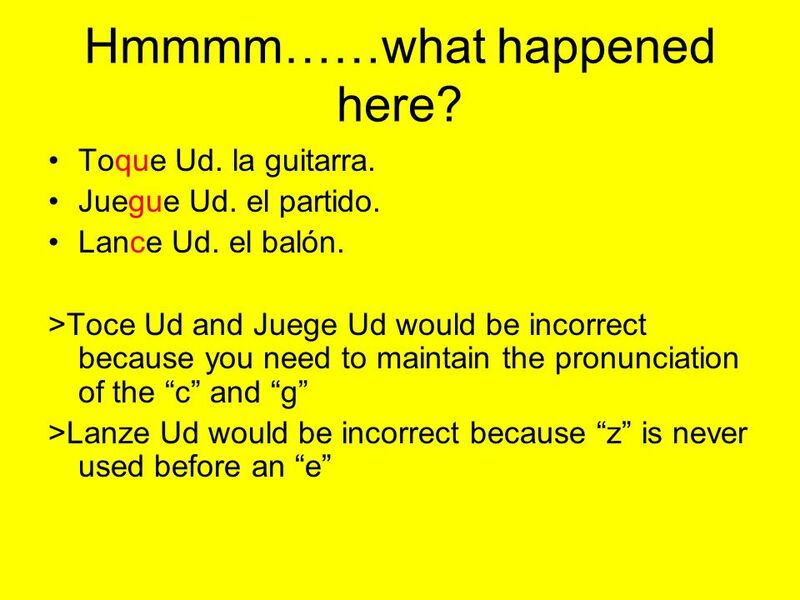 OK…once again: How do we form the subjunctive? 1.Start with the present tense “yo” form. 2.Drop the “-o.” 3.Add the opposite ending (“-e” for “-ar” verbs.